Since its inception in 2013, Art of the Real at New York's Film Society of Lincoln Center has been celebrating genre-bending, non-narrative filmmaking. In its sixth year, the series presents new such works by filmmakers from around the world, plus a retrospective featuring Japanese experimental filmmaker Toshio Matstumoto's non-fiction work and a tribute to the late Lebanese filmmaker Jocelyne Saab. If you are a curious about the possibilities of cinema as an art form, and hungry for something new and thought provoking as well as entertaining, the Art of the Real series is the place to be. The series runs from Thursday, April 18 through Sunday, April 28. For tickets and more info, please visit FSLC website. Swiss filmmaker Nicole Vögele's observational film Closing Time focuses on a tiny, late-night food stall owned by Mr. Kuo and Mrs. Lin, under a freeway overpass in Taipei. The couple prepares and cooks six nights a week. We barely get to see them in daytime. The sky is always dawn violet, the street is filled with thousands of mopeds, traffic lights and signs of the shops reflected on the puddles, with the sounds of the night. You get used to the rhythm of this working class microcosm. It's quiet and somnambulistic. On his moped, Mr Kuo takes off on the road in the latter part of the film and ends up in a small town down in the south of the country. We don't know what conspired for him to take this path. Was he tired of his daily routine? Did he want to get away? Doesn't matter. We are afforded the lush scenery of Taiwan's countryside. Beautifully composed in Super 16mm in a rainy season of Taiwan, Closing Time is a contemplative film shedding a light on a part of the world that rarely gets attention. Valencia in southern Spain is a home of the Colombicultura, an exclusively male subculture where brightly colored male pigeons train and compete. Filmmaker Elena López Riera who grew up in the region, documents one of these competitions. The lone female pigeon is released in the air. Soon all male pigeons take to the air, chasing after her. There are amazing amount of rules and judges, all with walkies, who watch intently every single move of these horny pigeons. It's not the speed, the narrator says, but lust and the ability to conquer. I don't know what that means exactly. 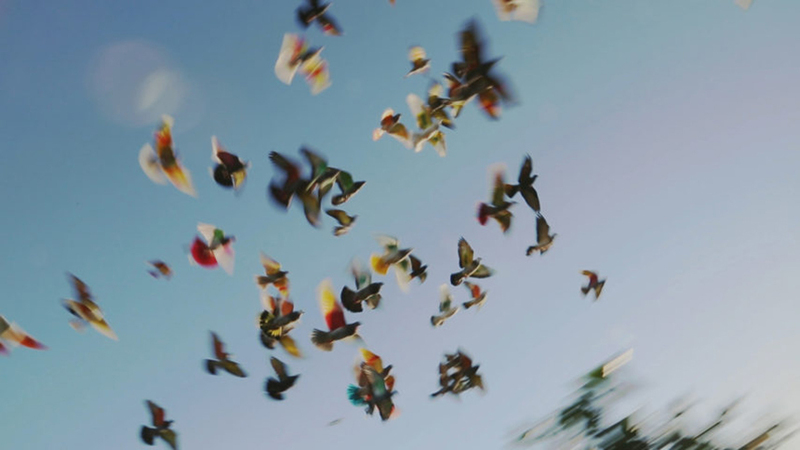 We see the swarm of pigeons in the air, on the ground. It's an orgiastic sight. But the competition ends due to bad weather before anything is determined. Those Who Desire is the grossest projection of macho culture I've ever seen, but it's also fascinating. Karelia, the Northwest republic of the Russian Federation, bordering Finland, has a rich cultural and political history. It has been occupied by Sweden, Finland and Russia. Spanish filmmaker Andrés Duque tries to link the cultural significance -- the origins of a Finnish epic where legends and magic exist -- with today's Karelia and ends up with documenting a Orthodox Christian family, the Pankratevs, living in the remote area surrounded by nature, practicing some of the shamanism rituals handed down from generations. This first part of a planned two-part film about the region, Duque also digs up the not so flattering history of Stalin-era massacres that took place in the same woods where the Pankratev children play, and the Putin regime's effort to rewrite history. 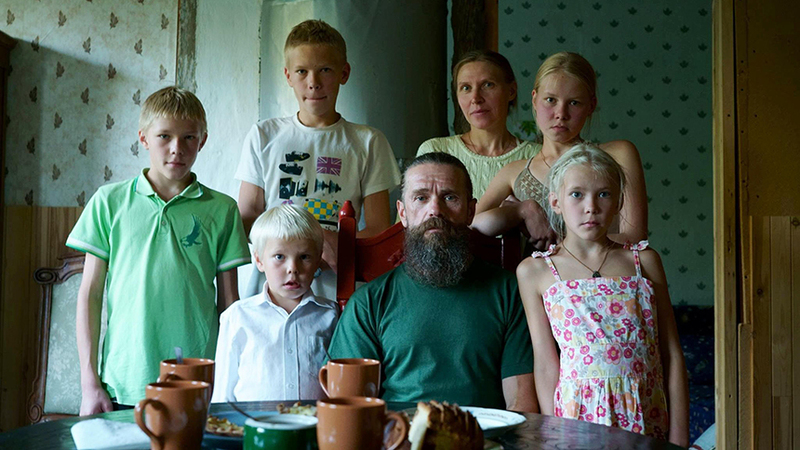 An interesting history lesson contrasts with idyllic family life in Karelia. Movement of a Nearby Mountain starts with a narration which tells of a water fairy who was captured by hunters. In order to free herself from impending enslavement, the fairy promises the eternal riches pointing to the mountains. Iron. "Gold lasts a breath, silver lasts a lifetime and iron lasts forever." Soon as the fairy was let go, it disappears into the water laughing. Its laughter forever lingers in the forest. This narration repeats at the end of the film; once in German, the other in Igbo. Cliff is a Nigerian man who owns and operates a chopshop in the Austrian Alps. He works there, cooks and eats there, shaves there; it seems like he spends his waking life there. He buys cars, refurbishes them, sells them whole or in parts, and also exports them to Nigeria. He deals with Hungarians and other Eastern European customers, sometimes in English, sometimes in German. Sometimes things heat up haggling the prices, but he seems to have his usual customers and is well-liked. But he is usually alone, spending his days working. He sings Christian hymns under his breath. We see a man of two worlds, bound by metal. The chorus of insects in the Nigerian jungle at night carries over the driving shot in the snowy Austrian Alps on the autobahn. Sebastian Brameshuber's contemplation on these contrasts and the intimate portrait of one man against the stunning forest backdrop speaks volumes without saying much. Hawaii's Big Island is, at a glance, both a paradise and a hellscape: the luscious vegetation along the coast contrasting vast black volcanic field created by overflowing volcanic activity inland that resembles the surface of Mars. Filmmaker Sarah Christman examines the intersection of elemental and superficial, nature and technology, ancient traditions and development, looking inward, and space exploration, extinction and survival through the eyes of Manu, a preteen girl and her family, who are in the beekeeping business. Manu helps out with her mom's honey, producing by tracking wild bees, locating their beehives and relocating them. But she is also an average girl of her age, playing with My Little Pony toys in the sand and daydreaming while laying in the field. There are biologists collecting queen bees from the hives to study their swarming patterns and their survival. Manu's dad is a tribal activist protesting the construction of another large telescope on top of the sacred volcanic mountain, Mauna Kea (13,803 ft). Then there is a group of astronauts training for Mars exploration in isolation on the mountain, an ideal training ground because of similar climate (lack of oxygen and rough, barren terrain). Swarm Season features some spectacular scenery of molten lava flowing out to sea, miles of barren black field created by volcanic eruptions, the underwater explosions, as well as intimate, tender moments with Manu and her family. The film's philosophical musings and seeing the bigger picture don't overshadow its anthropological study of its people and surroundings. It's a great film. I've seen filming process as germination in one other film recently. It was Anocha Suwichakornpong's superb By the Time It Gets Dark. Whereas the idea of film relating to germination was more of a metaphorical one in By the Time, Tamer Hassan, Armand Yervant Tufenkian's Accession is more of a literal one. Thirteen correspondences (in letter form) about sending seeds are read mostly by someone related to the person who wrote it, in various places and times in America, over the lovely hand-processed 16mm footage. There are no other diegetic sound or effects sound to accompany these images and the narrations. Accession is a testament of America as an agricultural society. 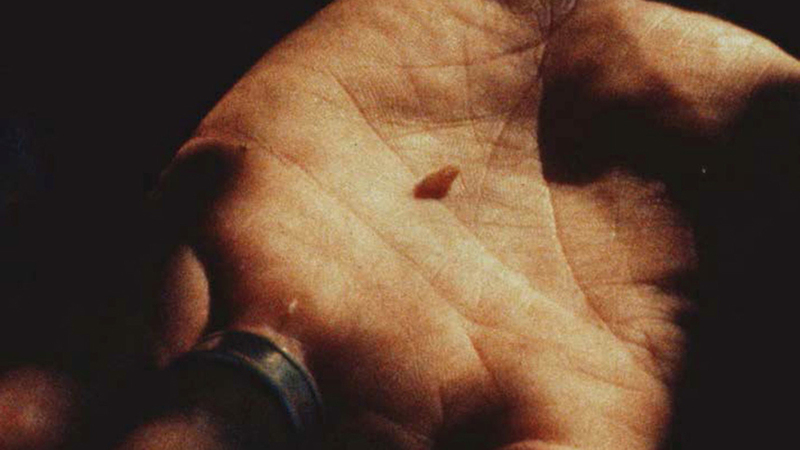 Seed keeping, passed down to generations in families, is a dying tradition; so is celluloid. Bringing forth new life year after year and nurturing those who sow, is somewhat equated here with the tradition of filming and the creative process of so called 'experimental films.' Melancholic and resonant, Accession is a lovely piece of cinema. Curonian Spit, a scenic peninsula in Lithuania, is a UNESCO Heritage site. It's also the home of Acid Forest, a swat of forests full of dead pine trees, occupied by thousands of big, black, migrating cormorants who make those trees their homes. It's a tourist attraction. There is an elevated wooden platform to take in the scenery. Many tourists from all over the world climb up the wooden stairs to witness the devastating view. They all have something to say in their native language. Some comment that it looks like a nuclear fallout, or tornado aftermath. The guide explains to a gaggle of Japanese tourists that trees died of the birds shitting on them constantly, to their amazement. Some invoke Alfred Hitchcock's The Birds. Many of these observations and amateur theories are downright hostile. Many jokes are heard about having a gun and shooting them all down. Many complain that the birds are protected by EU laws. Filmmaker Rugilė Barzdžiukaitė observes all the human activities from above, from a bird's eye view. 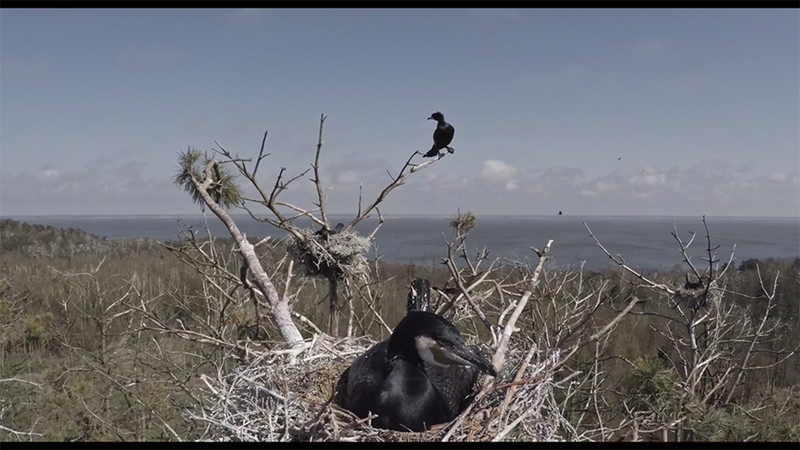 Constant flyover shots of the whitened branches of the pine trees reveal thousands of these birds making their home in Curonian Spit, oblivious of humans crowing their opinions down below. A biologist is heard explaining to a TV crew that many misconceptions about the birds are untrue, making a point that cormorants have existed since the age of dinosaurs and it's not only their droppings that kill the forests. But we see the human interference at the end, as we control much of our nature's destiny, unfortunately. Walden consists of 13 slow, 360° controlled panning shots from left to right. Each shot lasts about 10 minutes. 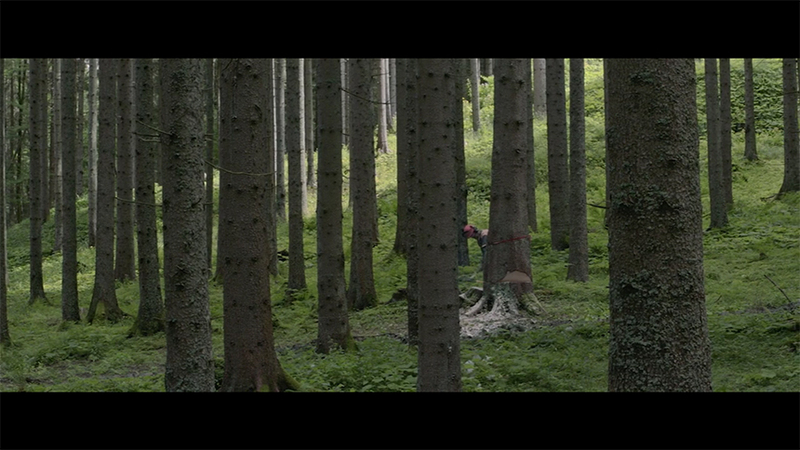 It starts in an Austrian forest where trees are being cut down with a buzz saw. Then the lumber is transported by trains, trucks, and boats all the way to the Amazon, where the lumber is finally transported by hands deep into the jungle. The film can be a slog for someone craving for a narrative or a character to hold on to, but the key here is giving yourself up to the flow as the panning, moving picture creates its own steady velocity. Each stage is strategically stationed and shot in wide format and 50 fps for maximum coverage and smooth movement, Swiss filmmaker Daniel Zimmerman's film takes an ironic, paradoxical look at a journey of timber in a global economy we are living in, done in a vigorously formalist approach.